Brian McDermott made a winning return as Reading manager as his side ended Blackburn's eight-game unbeaten run. Danny Williams struck a stunning half-volley from the edge of the penalty area for the only goal of the game. Jason Steele was given no chance in the Blackburn goal as the United States international found the top left corner with his angled right-footed shot. Fode Koita was denied a stoppage-time equaliser for the visitors as Jonathan Bond saved from close range. 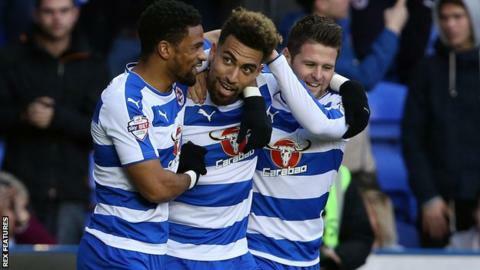 The win lifted Reading back into the top half of the Championship and halted a run of four successive defeats. McDermott, who was named Royals manager on Thursday following the sacking of Steve Clarke, could have seen his side win more comfortably had Steele not produced a number of fine saves. Williams' eye-catching strike from Hal Robson-Kanu's flick-on came moments after Koita missed a great chance to put Blackburn ahead from eight yards out. The Rovers striker headed over the crossbar unmarked after Craig Conway had picked him out with a dangerous free-kick. Sunday's result was the first time Reading have beaten Blackburn since October 1986 (12 meetings). Former Reading midfielder Hope Akpan did find the target before the interval for the visitors when his left-footed effort was palmed away by Bond. Williams was at it again after the break, testing Steele with an effort of his own from outside the box before playing in Garath McCleary for a shot that the goalkeeper also diverted away from danger. Blackburn's Jordan Rhodes fired over the crossbar after Conway's surging run into the area and then the winger was unable to get the ball under control as he nipped in at the back post. Ola John came off the Reading bench and immediately forced Steele into two more low saves cutting inside from the left wing. Rhodes was unable to find the target once more with a speculative shot over his shoulder before Bond was sharp to deny Koita in added time with his feet. "It was a lovely welcome. I had a really nice welcome in the car park beforehand, someone gave me some chocolate, that was lovely. "It felt like a home-coming but I just wanted to concentrate on the most important thing, which was to get a result. We've done that and I'm pretty happy. "The goal that's won it is straight out of the top drawer. I can't wait to see it again, it's a fantastic goal." "I couldn't have asked for any more. I thought we should have been a couple of goals up in the first half, the way we dominated the game. "But, sometimes you have games like that and you don't get anything from it. "We've been beaten by a wonder goal, a terrific strike. Not many goalkeepers would've got anywhere near that. "It's a first defeat for me since coming here, but whether you win, draw or lose a game, it's important you treat it the same as before you know it, the next game's on you." Match ends, Reading 1, Blackburn Rovers 0. Second Half ends, Reading 1, Blackburn Rovers 0. Attempt saved. Bangaly-Fodé Koita (Blackburn Rovers) right footed shot from the right side of the six yard box is saved in the bottom right corner. Assisted by Grant Hanley with a headed pass. Corner, Blackburn Rovers. Conceded by Oliver Norwood. Hal Robson-Kanu (Reading) wins a free kick on the right wing. Corner, Reading. Conceded by Markus Olsson. Offside, Reading. Chris Gunter tries a through ball, but Nick Blackman is caught offside. Attempt saved. Grant Hanley (Blackburn Rovers) right footed shot from the centre of the box is saved in the bottom right corner. Assisted by Shane Duffy with a headed pass. Substitution, Blackburn Rovers. Chris Brown replaces Craig Conway. Offside, Blackburn Rovers. Markus Olsson tries a through ball, but Bangaly-Fodé Koita is caught offside. Corner, Reading. Conceded by Lee Williamson. Attempt blocked. Oliver Norwood (Reading) right footed shot from outside the box is blocked. Assisted by Lucas Piazon. Attempt blocked. Nick Blackman (Reading) left footed shot from the right side of the box is blocked. Assisted by Oliver Norwood. Attempt saved. Nick Blackman (Reading) left footed shot from the right side of the box is saved in the bottom right corner. Assisted by Hal Robson-Kanu. Attempt saved. Ola John (Reading) right footed shot from the left side of the box is saved in the bottom left corner. Assisted by Nick Blackman. Attempt saved. Ola John (Reading) right footed shot from the left side of the box is saved in the bottom left corner. Assisted by Oliver Norwood. Substitution, Blackburn Rovers. Lee Williamson replaces Danny Guthrie. Offside, Blackburn Rovers. Craig Conway tries a through ball, but Jordan Rhodes is caught offside. Offside, Blackburn Rovers. Grant Hanley tries a through ball, but Ben Marshall is caught offside.